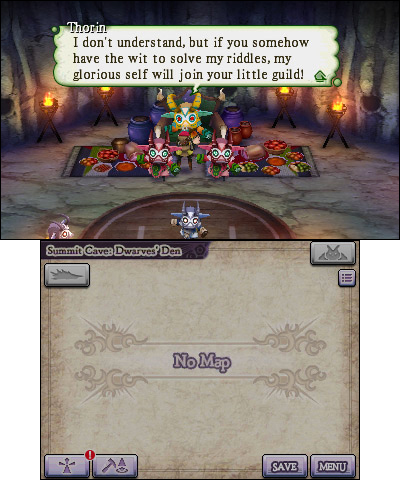 I had a lot of trouble getting into The Alliance Alive, which by all means has all of the elements of a great RPG. The trouble with the game doesn’t come from any issues with the game itself, but comes with the presentation. While all of the elements are there, and the game is a solid title to be sure, when you stack it up and compare it with similar titles, The Alliance Alive feels very underwhelming. Underwhelming – that’s how I felt while playing through the game, which I’ll admit I still have a ways to go. I must have been spoiled with Atlus’ previous RPG entry and its nearly fully voiced dialogue because The Alliance Alive doesn’t have any. Like an old fashioned RPG before there was the capability or budget to have voice actors speaking for the characters in a game, there aren’t any voices in the game. Another element which left me feeling underwhelmed was the music in the game. Overall much of the music was very soft and relaxing. It wasn’t uncommon for the music, which felt muted and passive, to remain unchanged into and out of a battle. The expected energetic music you would associate with a role-playing battle wasn’t there much of the time, mostly for battles on the world map. Battles should be events but they didn’t feel very eventful much of the time. I know, it sounds like I’m harping on the game already. It’s amazing how much you take the audio aspect of a game for granted until it misses the mark. 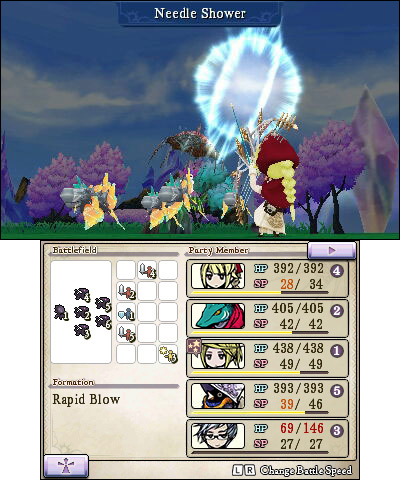 Despite the lackluster sound design in the game, The Alliance Alive is a pretty deep game once you get yourself into it. The way your characters progress in The Alliance Alive is different than I’m used to in most traditional RPGs. The characters don’t have levels in the traditional sense to level up so as you battle through the game you don’t really earn XP. Rather as you play, your stats will grow organically and will gradually increase after battles. Your HP or SP may rise a little bit after some battles. Since you don’t earn experience in battle and level up stats, your strength and defense are reliant on the equipment you have equipped. What you do earn after battles is talent points, which you can spend to upgrade your talents. The game has an interesting Arts & Spells and Talents system. As you attack with weapons equipped to your characters you will randomly “awaken” new abilities (or arts) for those weapons. The more advanced abilities you learn will cost you SP to use, but you can use some of the talent points to advance your skillset with a specific weapon. Doing so will lower the SP cost to use those abilities. Another interesting deviation from tradition is the usage of items. Unlike traditional RPGs where you have a deep pocket of items to use in battle, in order to use items in The Alliance Alive you’ll need to equip them first outside of battle. That means you’ll have one or two items per character to use in battle. Of course this means you’ll have to unequip a potentially useful item. It’s an interesting balance and adds a level of strategy to battles. Battles themselves are also pretty interesting. Prior to battles you can set the formation of your team, with characters up front or at the back. As you might expect you’ll do more damage from the front lines but you’ll also take more of a pounding. Conversely, your attacks won’t pack as much of an impact from the back row, but you’ll also take less damage. So it pays to station characters which use ranged attacks or magic a little further back. Now it feels like a bit of a handicap that are limited to the number of items which you can use in a battle, but something that is pretty interesting is that you will actually recharge your SP points during battle. Added to that, if one of your characters is KO’d during battle, you won’t need a special “revive” item to pick them back up. Any normal healing spell or item will do. Of course if all of your characters are KO’d that will end the battle. BUT, you should still try not to have a character knocked out. If one is knocked out they will be penalized with a reduced maximum HP until you rest at an Inn. Battles in the game aren’t random and are instigated with monsters which roam around the dungeons and overworld. When the spot you they will change colour and will chase you. If you manage to garner the attention of more than one monster you’ll initiate a battle chain in which you’ll fight the monsters in succession. Doing so may net you a bit of bonus TP. 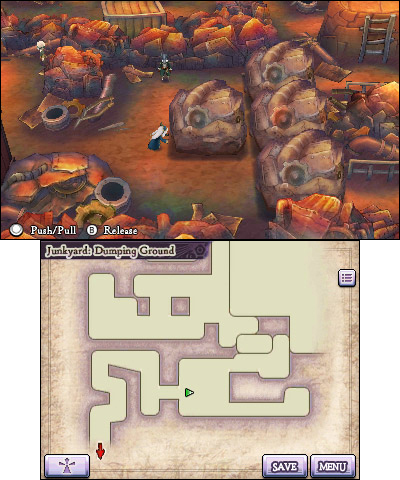 The Alliance Alive also has a variety if vehicles for you to use on the world map, which is a fun element to the game. The look of the game is somewhat reminiscent of what I remember of the look of Final Fantasy IX. Not quite chibi characters but very close to it. The style of the characters and the environments as a whole have the same simple look. Dungeons are camera locked but in the overworld you van rotate the camera around. It’s too bad there’s no 3D on the world map. There is very little 3D in the game. 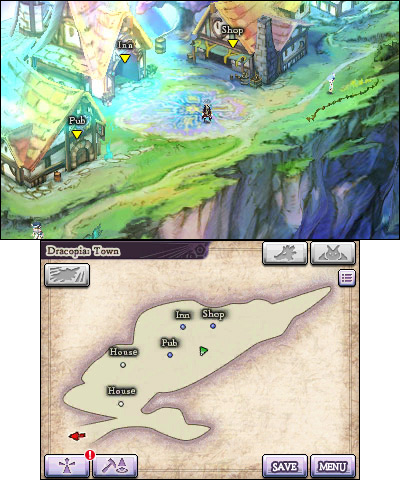 The 3D is limited to the menus when you have your character model displayed on the top screen and during the zoomed out view in towns, which you’ll only see if you wait for the game to pull the camera back. I’ve always said that you should review a game based on its merits alone and not as a comparison to other games. With that in mind The Alliance Alive is a good RPG. While the audio is a bit lacking, the game is fun to play.